The new version of SA2RATE is extended with a BOOST function, which amplifies the input level by 17 dB. Thanks to this option SA2RATE can directly cooperate with devices having a nominal output level of -10 dB, such as synthesizers, samplers, drum machines etc. It can also be directly inserted into effects loop in guitar amplifiers. 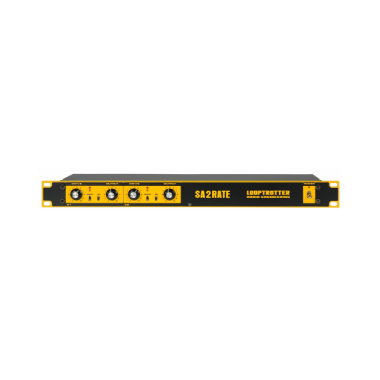 Simultaneously SA2RATE is equipped with a balanced output with nominal level of +4 dBu and can serve as in instrumental preamplifier. With an input signal level of about +4 dBu the BOOST function allows extreme saturation and signal distortion, which significantly widens the sound scape available through SA2RATE. SA2RATE is fully original design by LOOPTROTTER. It’s a result of many years of search and research on harmonic distortion and sound processing. SA2RATE will allow you to animate your mixes and introduce the characteristic, fat, analog sound into the digital world of recording and sound processing. SA2RATE refers to the sound of old tube mixing consoles and tape recorders. It can smoothly even the signal and intelligently introduce the low order harmonics. It also serves as an analog soft limiter. It’s capable of increasing the level of RMS significantly in a very musical and ear friendly way. With SA2RATE you can create solid and fat sound of instruments just during recording process. It also allows you to process already recorded tracks and subgroups during mixing. SA2RATE is fitted with perfectly paired channels which makes it applicable in mastering as well. 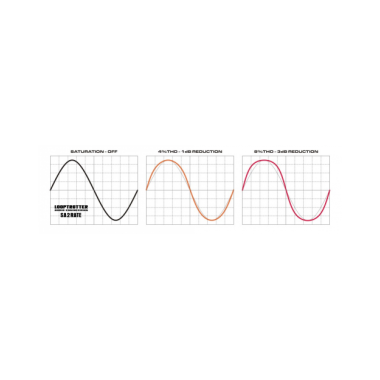 SA2RATE is equipped with the preemphasis and deemphasis circuits which significantly improve the processing of a signal with lots of low frequencies, especially drums and bass guitars. It’s also perfect for animating digital synthesizers, making them sound like old time analog synths. The reference point in working on SA2RATE was the saturation unit in Monster Compressor based on electron tubes. In SA2RATE we managed to achieve the characteristic sound of electron tubes using the semiconductors technology. SA2RATE is rid of wearing away electron tubes which in combination with the highest quality components guarantees long-term seamless operation.